The SolidWorks menubar is normally found at the top most portion of SolidWorks User Interface. In the menu bar contains mainly standard toolbar, Default Menu, Flyout Help menu and SolidWorks Search. Let us see the each toolbars in detail with tools functions, icon and flyout menu images. Checkout Best SolidWorks Training Materials here. Each standard tool buttons have side down arrow, which gives fly out menu contains supporting options.
. It also contains “Save, Save as, Save all and Publish eDrawings file”. Undo: It helps to reverse the design drawing to last section. By using the down tree you can select which step you need to undo it.
. The side drag menu contains other select option such as power select, volume select, select hidden, select all, toolbox, internal components etc. Options: Here you can change SolidWorks settings contain both system and documents properties. The down drag menu contains “customize” options and controlling of “Add-Ins”. To access the Solidworks menubar, click on the SolidWorks Logo, it shows the bar. It is look like other softwares menu, but contains full tools and helps to access each and every corner of this CAD software interface. The menu titles are File, Edit, Insert, View, Tools, Window and Help. Let us see each menu titles in detail with the aid of images. Here only shows the important menu options. This menu contains options like New, Open, Close, Save, Print etc are access directly from the standard toolbar which is shown above. Additional options like Print 3D, Publish to eDrawings, Find references and recent opened documents. The file menu is shown below. Print 3D: To print the product design as 3D model using the 3D printer. If you have 3D printer , you must install the driver for performing 3D printing operation. Publish to eDrawing: It helps to publish your design files to community forum or share with your client or customer using eDrawing tool. It contains additional options such as Appearance, Suppress/Unsuppress, Design and Bend table , which are not included in Standard toolbar. Copy To Adobe Illustrator: You can export the part model or file into the Adobe Illustrator (Graphics Design software) and it is helpful for the graphics designers. Suppress: If you want to suppress any part from the complete assembly of your design, use this tool. The unsuppress is just opposite to the suppress option. Appearance: It is appearance manager which manages the model appearance, material and sketch or curve color control. The view menu contains the user interface view tools controls, toolbar and other tools such as Redraw, Screencapture, Lights&Camera, Modify and Display tools. See Solidworks Heads-up Toolbar also. Redraw: It enables the redrawing of part file. Screencapture: You can take images or record the video of product design in your active document. The insert menu is very important to engineers or designers, because it contains solidworks features such as boss, cut, Pattern, fastening, Feature works, surface, Face, reference geometry, sheetmetal, mold design, weldments, Design study, tablets etc. The insert menu shown below. Boss/Base: It helps to add materials to sketch in different ways depends on the geometry and orientation. It contains options like Extrude Boss, Revolve Boss, Sweep Boss, Loft Boss, Boundary Boss and Thicken. Cut: To eliminate the materials form the designed part file. It normally used to drill hole, provide clearance etc operations. It contains Extrude Cut, Sweep cut, Revolve Cut, Loft Cut, Boundary Cut etc. Features: It contains other features such as Hole wizard, Draft, Dome, Warp, Fillet, Chamfer, Shell, Rib, Scale, Flex, Freeform, Deform etc. Pattern/Mirror: To draw different patterns of holes in linear pattern and circular pattern types. You can make the mirror image by using the mirror feature. Surface/Face: You can use the Solid works features in surface or face of the model. 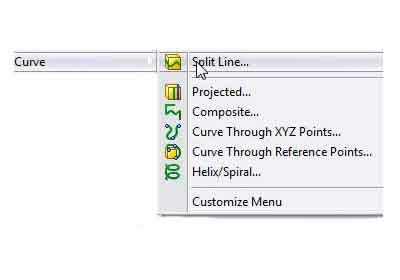 Curve: To draw curve or helix/spiral drawing in the part file. Reference Geometry: To create additional plane offset or on the surface of a model to extending the part file drawings or sections using Reference Plane, Axis, Point etc. Sheet Metal: To draw and create sheet metal parts like shim, frames etc. Mold: Help to design mold for manufacturing any product or component body. Weldments: To create fine weld joints of different sections which widely used in automotive industry. Design Study: To study the design and add various parameters to your current design. The tools menu contains various Solidworks packages like simulation xpress, Flowxpress, Explorer, DFM Xpress, Solid works Costing, Full Sketch tools, Various analysis tools etc. The sketch tools are Line, Circle, Rectangle, Polygon, Arc, Slot, Ellipse, SmartDimension, Parabola, Sketch Fillet, Spline, Sketch Chamfer, Sketch Trim Entities, Linear Sketch Pattern, Circular Sketch Pattern etc. This menu controls the opened windows of your designing interface. Using this menu you can view the opened graphics windows in Tile Horizontal, Tile Vertical or cascade. You can also arrange icons and close all the windows using this menu. It is search option of Solidworks, which helps to search for Solidworks commands, Files&Models, Knowledge-base, Soldiworks Help, and Community forum. Solidworks Command: Here you search the commands to draw the part file. You need to type “line” for selecting the line command etc. The automatic suggestions also enabled in it to find useful command, if you didn’t know the full name of the command. Files&Models: Search the previously designed or saved files and model from your harddisk. Knowledgebase: Search for the technical or design information on Solidworks. This article shows the important menu bar components with detailed images. It only explain the functions of tools, not shows the how tools work in Solidworks cad software. In the upcoming tutorial posts, you will see how to use each tool in Solidworks.